At the Mass of the Lord’s Supper, commemorating the institution of the Eucharist, on Maundy Thursday, 13th April 2017, in Westminster Cathedral, Cardinal Vincent washed the feet of 12 Chelsea Pensioners, recalling the Lord’s washing of his disciples’ feet at the Last Supper. In his homily, Cardinal Vincent explained the origin of the word ‘Maundy’, or mandatum, meaning command. As Jesus prepares his disciples for his impending Passion and death, he gives them a ‘double command: two inter-connected actions, which we do this evening,’ explained the Cardinal. The second command is ‘inseparable from the first. It is the command to love and serve one another, as symbolised in the washing of feet,’ said the Cardinal. ‘Service flows from the true participation in the Mass. 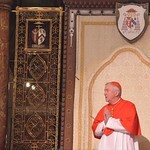 Service is the gateway through which we must pass in order to be truly part of this Eucharistic celebration,’ he added. After Communion, the Blessed Sacrament was solemnly processed from the sanctuary to the Altar of Repose in the Lady Chapel. The high altar in the sanctuary is stripped and all bells are silenced, adding to the mournful atmosphere for the Solemn Commemoration of the Lord’s Passion on Good Friday.